At various points throughout the year, my full time job puts on fundraisers — all proceeds of which go to a deserving cause local to our area. A few weeks ago, I offered my wreath-making skills as a donation to our annual silent auction fundraiser. I would custom-make a wreath for the highest bidder and their bid money would go straight in to the “donation pile”. 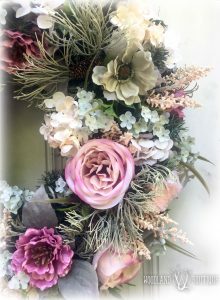 The lucky winner chose muted tones of pink, mauve and mint, but gave me carte blanch to do any style of wreath I wanted. I had been itching to try something different than a half-covered grapevine so, I dug through my craft room and came up with a 24″ evergreen base I got on clearance after Christmas last year. I also used 3 leftover pink blooms from a different project, plus some random pieces of bright green greenery from my stash, but those are purely optional as I really just wanted to use them up. You may also spot a tiny pine cone if you look closely. Again, a little surprise from my shash. And the bow is hand-tied – 2 x 5″ loops and 6 x 6″ loops. I’d like to take a moment to obsess tell you a little about this Juniper bush. 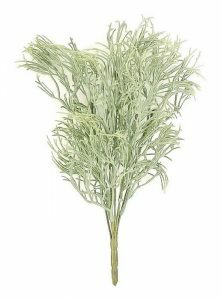 The color is a dreamy gray/green (a color that’s kind of hard to find at a good price point, honestly — think dusty miller & lambs ear but just a teeny bit on the yellow side), it fills gaps in your design nicely and gives a little bit of an unexpected texture and “pop”. The individual stems are the perfect length to tuck in pretty much anywhere. And just because it’s an evergreen doesn’t mean it’s only for the holidays. I’ve used it in multiple fall creations and would have used it all spring and summer if I had found it sooner. You’ll get 2 bushes when you purchase this from my shop. Each bush has 6 stems for a total of 12 stems. 1 bush should be more than enough for a half grapevine. You can even do some creative snipping to break each stem in to smaller pieces. For assembly, I fluffed the evergreen wreath base out really well before starting. First, I placed the bow (I had to flatten the evergreen branches underneath it so it wouldn’t look too crowded). All floral & greenery stems were cut apart and dipped in hot glue prior to insertion into the evergreen wreath base. My first layer was the brighter green foliage that you can see in the 10 o’clock position of the finished wreath (this is the foliage from my stash and as you can tell by the finished product, it’s barely visible after all is said and done, LOL.). Next up was the mixed bushes from Michaels — I used 2 bushes total and spaced the blooms out out until I was happy. Then came the sprigs of gray/green juniper, then the hydrangeas and then the minty blue/green baby’s breath and finally, the spikey peach berry sprigs. If you look closely, you can still see an evergreen branch where the wreath base is showing through in a few places, but I don’t think it detracts. When I shared this wreath on social media, it received over 200 likes, loves and comments in various groups in the span of 1 day! That’s kind of a record for me! I also received 2 more custom orders for “similar but different” dusty-hued creations. 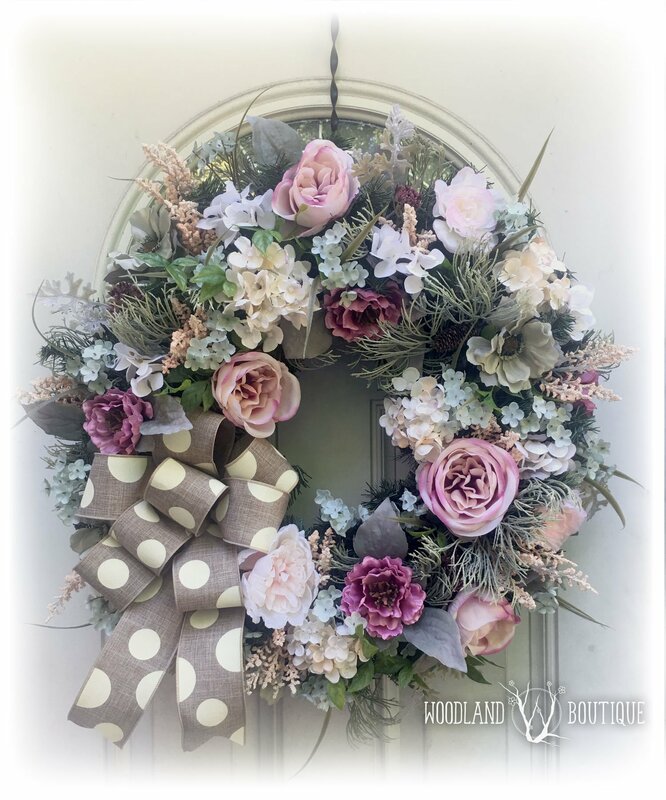 I made another trip to Michaels so I could make a copycat of this wreath for my shop and also to explore other muted color palettes to fill those custom orders. TLDR: Way to go, Michaels! Bravo on a non-traditional fall product line that really rocks my socks! I’ll be sharing these custom orders as I make them, but probably not as blog posts. Be sure to follow me on Facebook, Instagram or Pinterest to see what happens! If you would like to lay claim to the “little sister” of this wreath that i’m planning to make (and have an opportunity to choose your own ribbon), please contact me and I can design it to your specifications. In other news, i’ve hired my first employee! Check out this post on facebook to meet him! Previous Post: « Can we talk about Etsy? Exploring alternatives for your handmade biz.